WheelTurnerHawaii.com: 2014 - 2015 Hawaii Winter Outlaw Series Overall Ranking After Event 2. 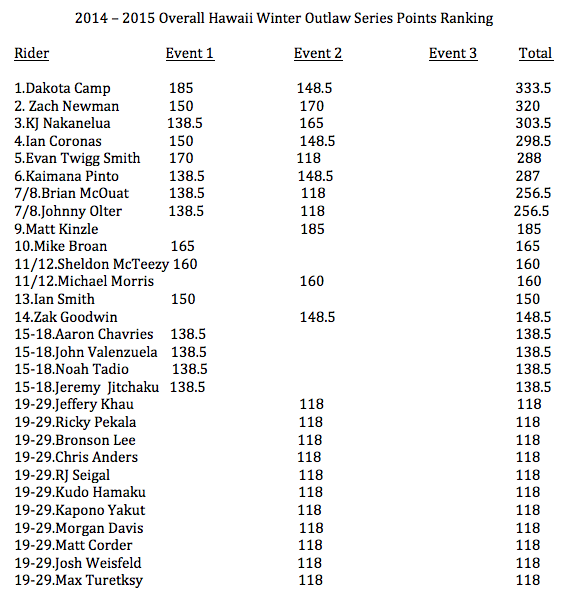 2014 - 2015 Hawaii Winter Outlaw Series Overall Ranking After Event 2. We are well underway with the 2014 - 2015 Hawaii Winter Outlaw Series, The Triple Crown of Downhill Skateboarding, and its been an epic season. The troops started over on the Big Island for the Big Island Flow Fest which was a perfect way to kick off the season. Next everyone gathered over on Maui for an INSANE Maui Challenge. Now to finish it off, everyone is meeting up on the south side of Oahu for The Scorcher 5 which isn't one to miss! Here are the overall series points ranking after the first two events. The top slots are close and it will come down to this final event to determine our series champ. Will Dakota Camp take it home for Maui for a second year? Or will one of the riders in his draft have what it takes to bump themselves into first. Find out this weekend after THE SCORCHER 5! Im human and humans do make mistakes... if you see something wrong with the points send me a message at stoked skaters@aol.com and i will get it fixed asap.